To Newquay this afternoon, to visit Pp's cousin Sarah, who was holding a charity tea. There was about a ton of (excellent) cake and scones, and my goodness it was hot. We met their cat, and their dog, but sadly not the stick-insects that apparently live in their rose-bushes, which were feeling shy. It's been a good few years since we had a summer quite like this. I'm not complaining though. It makes a nice change from the sticky humidity we've had the last few years, to have blazing sun and starry skies at night. 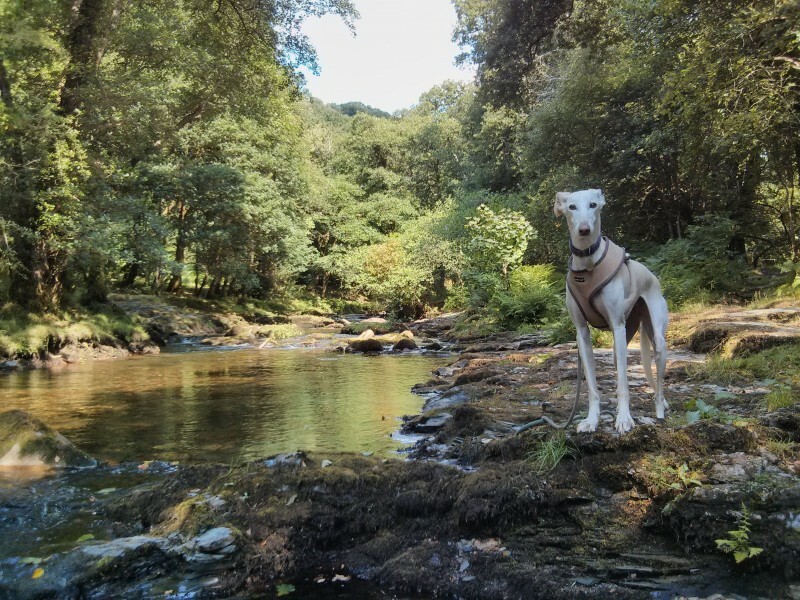 Lots of riverside walks too, to try to keep cool. Rosie is unimpressed with shady riverside walks. I think she'd rather be in the sun. Both photos are wonderful, but that top one is a stunner! I'm pleased it came out! Bit of a gamble. Lovely photos! I'm glad Rosie at least is enjoying the weather. I wish we had some shady riverside walks. I'm having to take Max out at 4.30am. By 9am it's sweltering, even in the forest, and all the pools Max normally swims in have long since dried up. I get the impression it's not so hot here as further East. I walked her at 8am this morning, and it was pleasantly cool in the shade, and not excessively hot in the sun, though it was getting warm by the time we got back to the car. I hope you and Max find some coolth! I would never have guessed it! It really is tremendously striking. Rosie is ever so majestic, and noble! 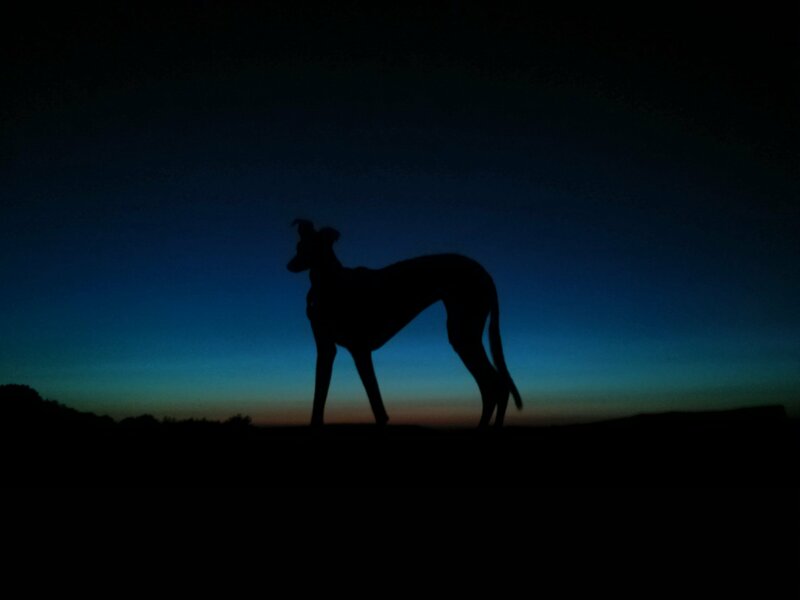 That Night Lurcher is such a lovely picture. I love the colours, and the way the silhouetting removes all sense of scale, and makes Rosie look like a towering giant of a dog, hundreds of feet tall on the far horizon. That first picture is amazing - I didn't think those colours ever came out in photos!